Pat Pineapple as drawn by Toby Bruno. It is time once again to announce the winner of the Order of the Pineapple. (This is only awarded once a year on January 18 aka Pat Pineapple Day). The honoree for 2019: Brenton Clutterbuck. Brenton Clutterbuck, self-proclaimed gonzo anthropologist, traveled around the world interviewing Discordians for Chasing Eris, perhaps the broadest view of Discordians of the late 20th and early 21st centuries. He also wrote Me and My Hair and Babble, and edited two issues of Intermittens (one of them a story collection) not to mention being interviewed in another issue of the magazine. 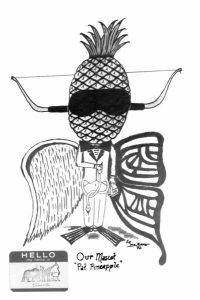 The Order of the Pineapple is also called the DisOrder of the Pineapple and the Pineapple DisOrder, but it’s usually abbreviated O.P. (The award has also been called Patus Pineappleus Bromeliadic and the winners The P.P. Bromeliadics or Bromedliaddicts). It honors those who have given extraordinary service to “the participatorial study of comedic attitudes and eccentric tendencies.” The O.P. is awarded to very few people, those who are especially servicey. It’s presented on only one day a year, January 18 CE, which is 18 Chaos of the Discordian calendar. That date is recognized as Pat Pineapple Day. Pat is the Mascot of the Ĕk-sĕn-trĭks Cluborguild which began the order, and the Patron Saint of the Discordian Division of the Ek-sen-triks CluborGuild which revived it after a 13-year hiatus. It is absolutely required that members of the Order eat something containing or resembling pineapple on January 18–unless of course they don’t feel like it. This entry was posted in Discordian and Ek-sen-trik, Family and Friends, Media and News, Religion and Philosophy and tagged awards, brenton clutterbuck, bromedliaddicts, chasing eris, discordia, discordian, order of the pineapple, pineapple. Bookmark the permalink. Congratulations to Brenton Clutterbuck! I’m surprised you didn’t list his name as Placid Dingo. I will check out that book! I didn’t know anything about the book til the nomination. Now I have to get it. Until they give the award to ME, this Disorder is STUPID! As soon as I win, the Order will be better than the Oscars. Congratulations Clutterbuck! Save the Dingos! Another one bites the pineapple dust. Congratulations! By the blood of my fathers this award great honor. Do no mock the memory of our honored ancestors or your own blood will be upon your own hands. So Clutterxxxx has now officially joined the Loveshade fxxxxxx like the fxxxing axxxxxx he is. We’re keeping an eye on you Clutterxxxx. Don’t be surprised if you get a little present in your inbox. Or kill me. This comment was censored as per our posting policy. Kudos to Brenton Clutterbuck and es Chasing Eris book which credits me with being a dozen different people. While I’d love to take credit for that, I don’t think I’m actually more than five people. If you don’t count the other five. I’d eat a fast food tastes-like-cardboard pineapple pizza in your honor if I could get one delivered out here. But instead I’ll have to settle for some delicious homemade pineapple chutney. Ah, the sacrifices one makes for the Order. Clutterbuck, Adam Gorightly, and the good folks at the Discordian Wiki have probably done more to spread the meme than anybody. Excepting ourselves, of course. And, you know, the people at that other website. I still don’t get what this is all about, but congratulations, I guess. I am pleased to see Brenton Clutterbuck join our bromeliac ranks. Brenton, I have posted an article on your recognition which should be linked here. I added a couple of notes including one about your United We Fnord which isn’t listed on the official site. I celebrated Pat Pineapple Day with a shrimp and pineapple salad. I’ll add my congratulations to the chorus. Happy Pat Pineapple Day and pass the pineapple on low-fat cottage cheese. So now Clutterbuck has been scared off so is now denying he’s a Loveshade groupie or alt? Too late, Clutterbuck. We saw your true colors years ago. Email address has been censored. We do not allow the posting of other people’s email addresses without permission. I think that everyone dreams about having his/her voice to be heard, but this is simply impossible! It’s a pity!